My size 15 feet have limited footwear options. Additionally, like most climbers, I wear much of my footwear tighter than the average individual. Most of the time this is fine, and I've become accustomed to a bit of mild discomfort in certain shoes by the end of a long day. However, I've rarely had severe foot pain. By the end of this past winter I was experiencing significant foot pain near my metatarsal heads (balls of one's feet). It felt like I had a pebble stuck under the balls of both feet all the time. I soaked my feet and shaved off the calluses, hoping this would provide some relief. Despite my efforts, my metatarsal heads continued to hurt. My Nepal Extreme boots, which have the padded orange Superfeet insole in them, really bothered my feet, and wearing crampons while walking made things worse. My training shoes weren't any better. My feet hurt me at home walking around my house. I couldn't walk down my bare wooden basement steps without pain. I began to worry. What if this continues to get worse? How will I work if my feet continue to hurt like this? I can't imagine working and playing outdoors every day with this sort of discomfort. Things didn't feel right. About a month and a half ago I made some changes. I stopped wearing mountain boots several days a week (winter ended). I began wearing my Birkenstock sandals more. 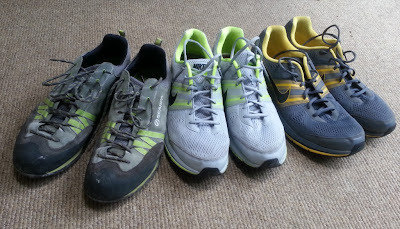 I've also been wearing my size 15 FiveTen Camp 4's more than my size 48 Sportiva Boulder X's, and I replaced both pairs of training shoes. My feet are feeling better. I can walk around barefoot again, and running has become easier. It's amazing actually - I'm getting more fit and I haven't worn training shoes this comfortable in years. In many ways, it was a good reminder that the decisions we make about our personal gear can really affect how we feel and how we perform. Subtle differences in fit, which may seem inconsequential, can have big impacts in our performance and comfort. Pain is never a good thing, and climbing footwear doesn't automatically need to be associated with tight footwear and discomfort. My Birkenstocks are comfortable and loose yet supportive. I'm wearing them a lot more than I used to. They allow my feet to relax. My toes can spread out. The Five-Ten Camp Four is size 15. I've had a pair for several years now, but I've only worn them casually. I began wearing them as approach and hiking shoes. They have much more cushioning, are wider, and longer than my Sportiva Boulder X (size 48), but don't climb nearly as well. I now wear rock shoes to guide even moderate pitches. I've begun wearing a good pair of trail running shoes to the crag more frequently. They're really comfortable and cushioned for walking but don't handle rocks and off camber slopes as well. 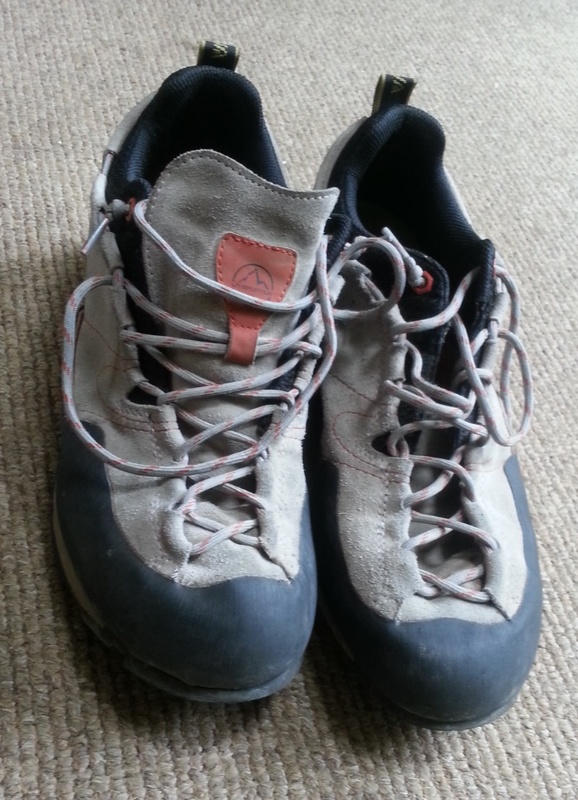 I bought a pair of Scarpa Crux shoes in size 48. They are similar to the Boulder X, but they are wider in the toe and softer in the forefoot. For me they have been more comfortable to wear than the Boulder X, but definitely don't climb as well. I replaced all of my regular training shoes. I just bought two pairs of Nike Pegasus 29's. They're my first Nike running shoes in 17 years and they're working really well so far. They're good for training and still have plenty of cushioning, but are light enough to race in.